Strategically located in the modern business park of Redditch, these offices are surrounded by numerous companies and amenities. Modernly furnished and provided with reception area, these offices offer a professional working environment. The business park is close to the motorway and well connected to the airport. Flexible, fully furnished offices in Redditch town centre. Conveniently located a short walk away from Redditch railway station, with superb motorway connections via the M5, M6, M42 and M40. Birmingham International airport and the NEC are also within easy reach. Additional meeting and conference available, with high spec technology support. There is 24-hour access to the space, as well as a security system. Two miles from Redditch Town Centre this established business area is also just 14 miles south of Birmingham City Centre. Offering various sizes of industrial units and a range of modern office suites that are furnished with cupboards and desks. Conference room facilities also available for hire. With a fun and modern interior design this bright office space is located within a period building close to bus and train stations as well as having easy access to the motorway network. 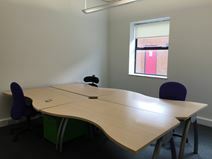 Ideal for creative and design businesses who require access to the latest technology and a high speed internet connection.